The Garlic Twist is the only garlic tool I'll use and the only one you'll look forward to using! 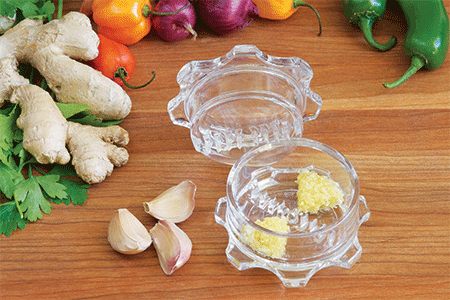 Unlike a garlic press, it's multi-functional and easy to clean! Only half the garlic ever seems to actually come out. When it’s not in use, it sits in the drawer taking up space. They’re usually miserable to clean! 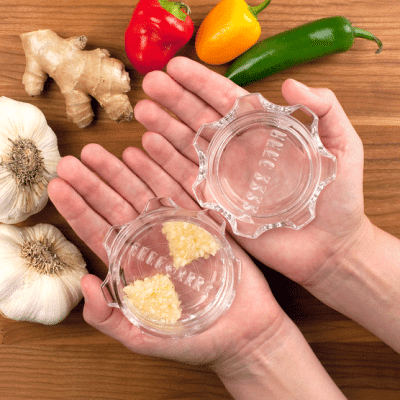 The Garlic Twist is a multi-functional tool that makes mincing garlic, ginger, shallots, chili peppers, olives and pickles easier than ever! Use the flat bottom to break apart heads of garlic and separate into cloves as well as crack and peel the skin. Place the peeled cloves inside. Twist unit back and forth, mincing to desired texture. Twist the top unit back and forth to tightly pack the bits into two small triangles. Use a spoon or other utensil to remove the minced garlic. Unlike a garlic press, it’s easy to clean! Rinse clean and air dry or put on the top rack of the dishwasher for cleaning!